I’m on my third Relay and my second time being a team captain. If you have never heard of Relay for Life, it is a fundraising event for American Cancer Society, some events are 12 hours and some 24 hours. You build a team or join a team, and the general idea is to have someone walking on a track all through the night. You fund raise before and at the event, they make it slightly competitive but mostly fun. My team has grown this year. We are doing a great job working together. We have taken on a few big projects and are being very ambitious. I love that. There are no limits to these girls ideas as far as fundraising and they all have such an open and helping heart. Many of us have been affected in some way by cancer, so there is a good deal of passion in my group. My mother is a survivor. She doesn’t see it as any strong feat because the way she see’s it, its just something most of us go through at one point or another, it’s like a game, you either win or lose, no need to be boastful. I on the other hand take some pride in that, in hopes that when I too am faced will these fears I too will be able to defeat them with the help of modern medicine. 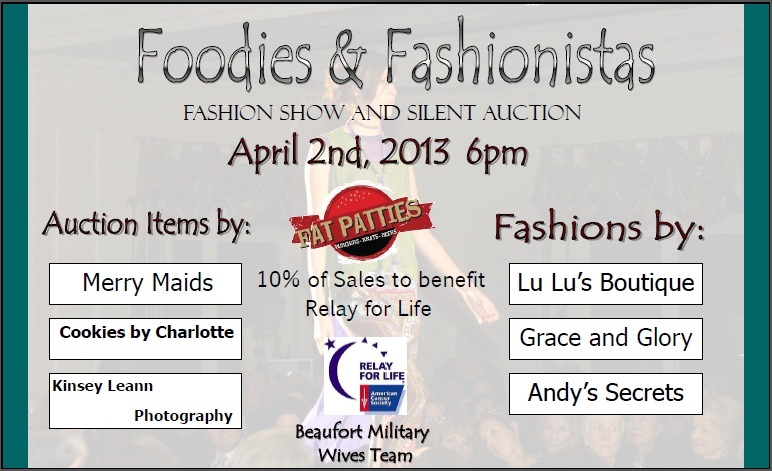 Our biggest fundraiser for our team this year will be a fashion show/silent auction. I wanted to create a way to stimulate local economy, while giving back and having fun/doing something I love. We are so thankful for everything coming together so far. We have three store dressing models, an awesome restaurant has donated space, time and a percentage of sales, several local businesses are donating for the silent auction and people are donating their time for make up, photography, and modeling. As we get closer to time, I am trying to find way for my kids to get involved. They generally go to Relay and do the bounce houses, face painting, and fair like food. They may camp out with us over night at the event this year. I think it’s important for kids to be involved and to see their parents doing something outside themselves. I am hoping that over time they learn, through this and other volunteering, that giving back in any way is the most rewarding thing you can do. On top of our team activities I have decided that if I met my goal this year I would shave my head and stream it live. Already about 1/3 of the way there and still have little over a month.